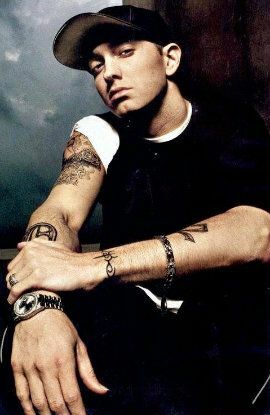 Showing search results for Eminem Quotes, Quotations & Sayings 2019. 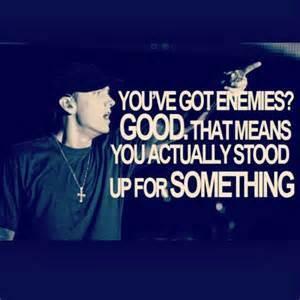 You've got enemies? Good that means you actually stood up for something. Sometimes you just gotta let sh*t go and say "to hell with it" and move on. Somebody once told me to seize the moment and not squander it. 'Cause you never know, it could be over tomorrow. It all came, and for me, hip-hop has done more for racial divide and racial sort of bringing together than anything in the last 30 years. Seeing people like eminem sounding like somebody like Jay-Z and just the racial aspects of it all. I love Britney Spears, Drake, eminem, and Chris Brown! Snap back to reality, Oh there goes gravity. When I'm gone just carry on, don't mourn, rejoice every time you hear the sound of my voice. Just know that I'm looking down at you smilin', I didn't feel a thing so baby don't feel no pain, just smile back.. I try to keep it positive and play it cool. shoot up the play ground and tell the kids to stay in school. Why does a grown man, 50 years old, and president of the US brag about having eminem on his IPod. I mean yeah, I dug EM, then I hit puberty.